For one eventful year director Emily James was allowed unprecedented access to film the secretive world of environmental direct action. 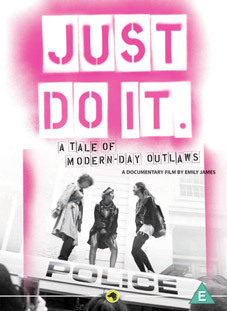 The result is the eye-opening Just Do It: A Tale of Modern-Day Outlaws, which comes to DVD courtesy of Dogwoof. The world of eco activism has rarely been seen on film due to its underground! nature, but this inspiring feature documentary reveals the determination and risk of some of its larger than life campaigners. Emily James spent more than a year embedded in activist groups such as Climate Camp and Plane Stupid to document their clandestine activities. She joins them as they climb over fences, wade through mud, blockade factories, attack coal power stations and glue themselves to the trading floors of international banks despite the very real threat of arrest. Just Do It entertainingly and illuminatingly lifts the lid on climate activism and the daring rebel rousers who have crossed the line to stand up for what they believe in. Following its successful cinematic release Just Do It will be released on UK DVD by Dogwoof on 17th October 2011 at the RRP of £14.99. To coincide with the DVD release, Just Do It is also venturing to schools, colleges and universities on 18th October 2011 for an unprecedented day of campus screenings, nationwide.